PCS'ing? 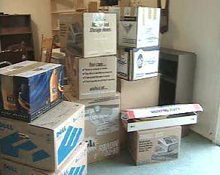 If a permanent change of station, or PCS, is in your future, you may have questions about moving. As part of the Military and Family Support Center, the Relocation Assistance Program provides services and resources to help make this transition as smooth as possible. Most relocation programs offer one-on-one consultation. In particular, those making their first military move, those making their first overseas move or those with challenging or complex situations should contact the relocation assistance office.